The Android Market isn’t only where you buy apps for your Droid X; it’s also where you perform app management. App management includes reviewing apps you’ve downloaded to your Droid, updating apps, and removing apps you no longer want. The Downloads list is accurate in that it represents apps you’ve downloaded. 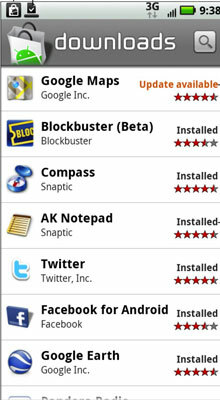 Some apps in the list, however, might not be installed on your Droid X: They were downloaded, installed, and then removed. One nice thing about using the Android Market to get new software is that the Market also notifies you of new versions of the programs you download. 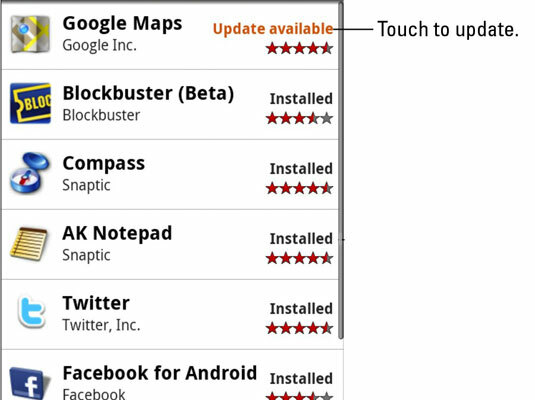 Whenever a new version of any app is available, the Updates Available notification icon appears. Turn on the phone’s Wi-Fi access, if it’s available. Updates are downloaded from the Internet, which means the faster your phone can connect, the more quickly the updates are made. Choose the updated app; touch it to open more details. Touch an app with the Update Available flag. Touch the OK button to heed the warning. Downloading an update means that an entirely new version of the app is downloaded and installed, replacing the current version. That’s okay. (Optional) Read any services that the app uses on your phone and then touch the OK button. After the download is complete, pull down the notifications and select the downloaded app from the notification list. When you first start the updated app, you may be asked to agree (again) to the licensing terms. Touch the I Agree button, if necessary. Now you can start using the app. You just don’t like a program or it does something so hideously annoying that you find removal of the app to be emotionally satisfying. You have a better program that does the same thing. You want to free up a modicum of storage on the phone’s internal storage area or MicroSD card. Choose the Downloads heading to summon a list of all software you’ve downloaded into your phone. Touch the app that offends you. Touch the OK button to confirm. Fill in the survey that appears to specify why you removed the app. Be honest, or be as honest as you can given the short list of reasons. The app continues to appear on the Downloads list, even after it’s been removed. After all, you downloaded it once. That doesn’t mean that the app is installed. In most cases, if you uninstall a paid app before 24 hours has passed, your credit card or account is fully refunded. And you can always reinstall paid apps that you’ve uninstalled. You aren’t charged twice for doing so.